Is Climate Change the Number One Threat to Humanity? | Watts Up With That? I have a new paper in Wiley Interdisciplinary Reviews: Climate Change, which asks the question, Is Climate Change the Number One Threat to Humanity? This is threshold question to which many who believe global warming constitutes an existential threat to humanity would answer in the affirmative, although as the paper points out, there is no analysis that supports that conclusion. This paper provides an analysis that attempts to answer this question. It is built on previous efforts that have tried to answer this question. The paper has been peer reviewed even though it’s labeled as an opinion piece. Unfortunately, the published version requires a subscription. An earlier draft can be found here. Considering the tribal nature of much of the debate surrounding global warming and the general unwillingness of, for lack of a better word, “warmists” to engage in a dispassionate exchange of views, it was very courageous of the editors not only to invite me but, what’s more, to actually publish my contrarian piece after they had read it! There were at least three reviewers, and the process itself was very fair and professional. The exchanges with reviewers did, indeed, help sharpen the basis for my conclusions. Also, Mike and Myanna, recognizing that I was offering a perspective contrary to most of their readers’, allowed me more space than probably would have been afforded to others. To me, this indicates a genuine desire for a discussion of a contrarian viewpoint as opposed to a cosmetic, pro forma effort, which is what the IPCC process sometimes seems to resemble. I thank Mike, Myanna, the Editors, and the reviewers for their professionalism, open mindedness, and, in fact, the entire experience. Although I’m no longer unbiased, they have, IMHO, done themselves — and their journal — proud. Abstract. This paper challenges claims that global warming outranks other threats facing humanity through the foreseeable future (assumed to be 2085–2100). World Health Organization and British government-sponsored global impact studies indicate that, relative to other factors, global warming’s impact on key determinants of human and environmental well-being should be small through 2085 even under the warmest Intergovernmental Panel on Climate Change (IPCC) scenario. Specifically, over 20 other health risks currently contribute more to death and disease worldwide than global warming. Through 2085, only 13% of mortality from hunger, malaria and extreme weather events (including coastal flooding from sea level rise) should be from warming. Moreover, warming should reduce future global population at risk of water stress, and pressures on ecosystems and biodiversity (by increasing net biome productivity and decreasing habitat conversion). That warming is not fundamental to human well-being is reinforced by lower-bound estimates of net GDP per capita. This measure adjusts GDP downward to account for damages from warming due to market, health and environmental impacts, and risk of catastrophe. For both developing and industrialized countries, net GDP per capita—albeit an imperfect surrogate for human well-being—should be (a) double the current U.S. level by 2100 under the warmest scenario, and (b) lowest under the poorest IPCC scenario but highest under the warmest scenario through 2200. The warmest world, being wealthier, should also have greater capacity to address any problem, including warming. Therefore, other problems and, specifically, lowered economic development, are greater threats to humanity than global warming. (a) Compares the global impacts of global warming through the foreseeable future against the impacts of other factors on key determinants of human and environmental well-being in order to gauge whether the negative impact of warming on these determinants exceeds that due to the other factors. (b) Checks whether human well-being, as measured by net GDP per capita for developing and developed countries through the foreseeable future (and beyond) is projected to be lower under the warmest scenario (per the IPCC’s Special Report on Emission Scenarios, SRES) than under the cooler scenarios. (c) Ecological impacts, based on net biome productivity (a measure of carbon sink capacity), habitat lost to cropland, and loss of coastal wetland. The future global impacts of global warming on key determinants are derived from the Fast Track Assessments (FTAs) sponsored by the British Government.,, Most of the FTA authors also co-authored various chapters of IPCC’s Second, Third and Fourth Assessment Reports. They include, for example, Martin Parry (Chairman, IPCC Working Group II during the preparation of AR4), Nigel Arnell (lead author, LA, water resources chapter, AR4), Robert Nicholls (coordinating LA, coastal systems, AR4), and Sari Kovats (LA, human health, AR4). 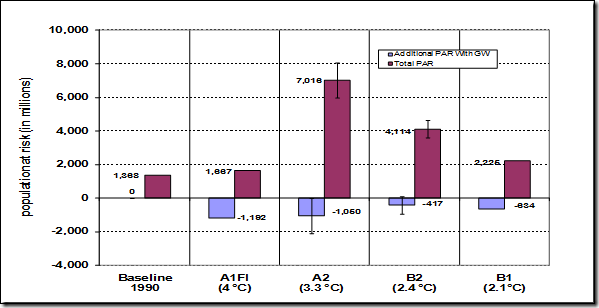 Not surprisingly, the FTA reports get substantial play in the IPCC reports. I note all this only to emphasize that, from the perspective of those enamored with the consensus, the provenance of my estimates ought to be impeccable. (a) Through 2100, the GDP per capita in the absence of warming is taken directly from the assumptions used to construct each IPCC scenario. Undaunted by the fact that the IPCC scenarios only extended to 2100, the Stern Review provided estimates through 2200.24 [An obvious example of economists treading where even fools would not dare.] My estimates for the unadjusted GDP per capita, however, assume lower economic growth than the Stern Review. (b) Damages from warming are based on the Stern Review’s 95th percentile (upper bound) estimate. But the Stern Review’s central estimate “lies beyond the 95th percentile—that is, it is an outlier.” That is, the damages of warming that I have used are based on an upper bound estimate from an outlier. Moreover, the Stern Review’s central estimate, like other studies, overestimates the costs/damages from global warming partly because it does not fully account for increases in future adaptive capacity (see below). Thus, the net GDP per capita estimates used in the paper should be lower bound estimates. This violates the IPCC’s methodological guidelines for impact assessments, which require consideration of autonomous or automatic adaptations. These adaptations depend on, among other things, adaptive capacity, which should advance with time due to the assumption of economic growth embedded in each IPCC emission scenario (see Figure 1).9,10,, However, these advances are rarely accounted for fully in impacts assessments. For example, the FTA’s water resource study totally ignores adaptive capacity while its malaria study assumes no change in adaptive capacity between the baseline year (1990) and projection year (2085) (see here).9 Consequently, the assessments are internally inconsistent because future adaptive capacity does not reflect the future economic development used to derive the emission scenarios that underpin global warming estimates. Figure 1: : Net GDP per capita, 1990-2200, after accounting for the upper bound estimates of losses due to global warming for four major IPCC emission and climate scenarios. For 2100 and 2200, the scenarios are arranged from the warmest (A1FI) on the left to the coolest (B1) on the right. 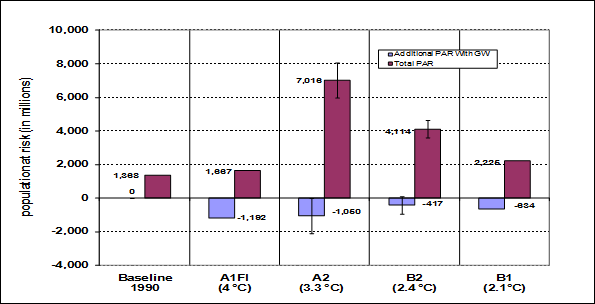 The average global temperature increase from 1990 to 2085 for the scenarios are as follows: 4°C for AIFI, 3.3°C for A2, 2.4°C for B2, and 2.1°C for B1. For context, in 2006, GDP per capita for industrialized countries was $19,300; the United States, $30,100; and developing countries, $1,500. Source: Ref. 42. Long-term projections that neglect economic development and secular technological change often overstate impacts by an order of magnitude or more.12,For example,the FTA’s malaria study assumed static adaptive capacity between baseline and projection years (1990–2085). Applying the same assumption to project U.S. deaths in 1970 from various water-related diseases—dysentery, typhoid, paratyphoid, other gastrointestinal disease, malaria—using data from 1900 implies freezing death rates at 1900 levels. But, in fact, from 1900–1970 they declined by 99.6%–100.0%.12 Similarly, because of the increase in adaptive capacity globally, global death rates from extreme weather events have declined by 98% since the 1920s. Despite the systematic overestimation of net negative impacts, my paper uses the FTA results without adjusting them downward. Results of the analyses are summarized in the last two subsections of the paper. Following is a lightly edited version of these. Note that footnotes have been dropped, figures have been renumbered, and I have “bolded” certain words and phrases. With respect to water stress, despite massive population growth, the share of global population with access to safe water and improved sanitation currently continues to increase, and deaths from drought have declined by 99.9% since the 1920s. In the future, water-stressed populations may increase, but largely due to non-climate change factors. However, warming, by itself, may reduce net water-stressed population (Figure 4). Aggressive mitigation to limit the global temperature increase to 2 °C, may, moreover, increase net water-stressed population, relative to either the “unmitigated climate change” case. 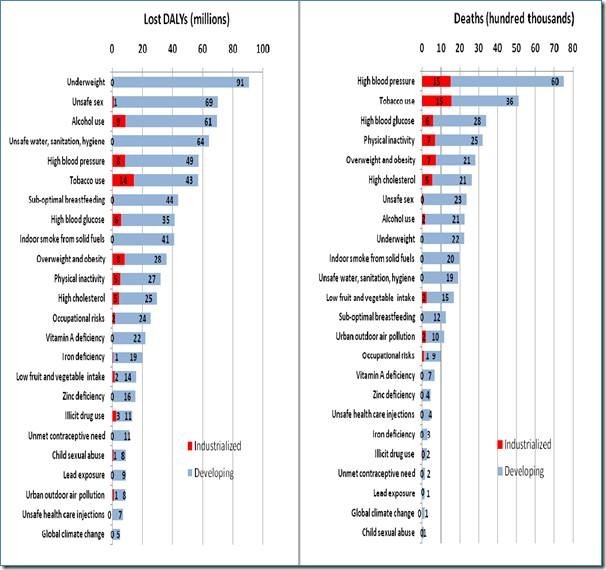 Figure 2: Ranking global public health priorities based on mortality (right hand panel) and disability-adjusted life years (DALYs) lost prematurely (left hand panel) in 2004 for 24 health risk factors. 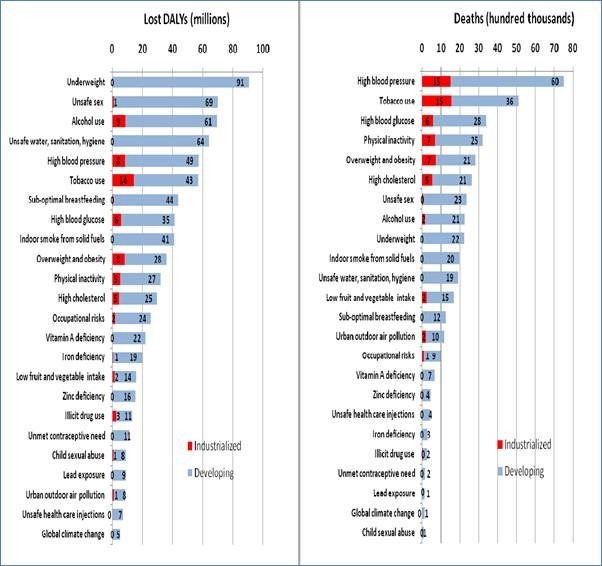 The total length of each bar indicates the magnitude of deaths or lost DALYs globally to the specific health risk factor. For developing countries, the ranking of global warming is unchanged, whereas for industrialized countries, it would rank second last on the basis of deaths, and 4th last on the basis of lost DALYs. Figure 3. Deaths in 2085 due to Hunger, Malaria and Extreme Events, With and Without Global Warming. Only upper bound estimates are shown for mortality due to global warming. Average global temperature increase from 1990-2085 for each scenario is shown below the relevant bar. Figure 4. Population at Risk (PAR) from Water Stress in 2085, With and Without Global Warming. The vertical bars indicate the PARs based on the mid-point estimates of several model runs, while the vertical lines indicate the range of estimates. 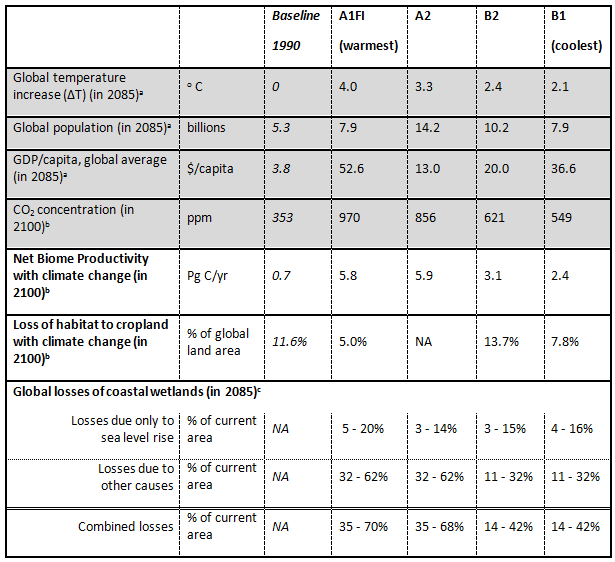 With respect to ecological impacts through 2100, global warming might (a) increase net biome productivity, which translates into greater vegetation and net carbon sink capacity; and (b) decrease the amount of habitat converted to human use, which would reduce pressures on biodiversity and ecosystems (Table 1). However, coastal wetlands are projected to be further reduced, but more because of non-climate change factors than climate change (Table 1). Table 1: Ecological indicators under different scenarios, 2085-2100. These results also indicate that if climate were to be rolled back and frozen at its 1990 level—something that is infeasible with current technology without also risking rolling back economic development and increasing poverty to levels corresponding to pre-World War II levels—then in 2085, mortality from malaria, hunger and extreme weather events would be reduced by no more than 13%, the net water-stressed population might increase globally, and threats to biodiversity and ecosystems might, likewise, increase. Thus, in aggregate, while global warming may be important, other factors would have a much greater net adverse impact on human and environmental well-being through the foreseeable future. The above conclusion is reinforced by estimates of future net GDP per capita. Figure 1 [derived using the results of the Stern Review] indicates that net GDP per capita in both developing and industrialized countries should be highest under the richest-but-warmest (A1FI) scenario and lowest under the poorest-but-most-populous (A2) scenario at least through 2200. Accordingly, GDP per capita should itself serve as an approximate indicator for human well-being. And since the Stern Review estimates include losses from market effects, non-market effects from environmental and public health impacts, and the risk of catastrophe, the net GDP per capita shown in Figure 1 should also serve as a useful but imperfect indicator of human well-being that fully considers the effects of unmitigated warming. In any case, because climate change impacts assessments as a rule do not provide projections of life expectancy and educational factors that could be employed to estimate HDI, future net GDP per capita, despite its imperfections, is perhaps the best one can do for an indicator of future human well-being that also accounts for the impacts of warming. Figure 1, therefore, indicates that if humanity has a choice, it ought to strive for the developmental path corresponding to the richest scenario notwithstanding any associated global warming. Finally, the wealthiest scenario should also have the highest adaptive and mitigative capacities to address not just climate change but any other problem. As shown elsewhere,10,12,13 the determinants of human well-being improve with economic and technological development. The relationship is somewhat more complex for environmental determinants: initially these determinants deteriorate, but then go through an environmental transition after which they begin to improve, with development.12,13 This is why the wealthiest countries generally have a cleaner environment, greater reversion of agricultural lands to nature and, de facto, more stringent environmental protections than developing. Given the projections of net GDP per capita (Figure 1), all countries are more likely to be on the right side of the environmental transition by 2100, particularly under the warmest scenario. A corollary to this is that if greenhouse gas policies effectively increase poverty, e.g., by slowing economic growth or increasing the prices of basic needs (such as food to adequately fulfill the body’s energy requirements or fuel to maintain safe ambient conditions) then the resulting mortality increases might, given the climate system’s inertia, exceed any reductions in these health effects due to GHG reductions for decades. To summarize, climate change is not the world’s most important problem. Other problems have a larger negative impact on human and environmental well-being. Reduced economic development, in particular, would be a bigger problem, especially for developing countries. And if climate change policies compromise such development, they too can become problems despite the best of intentions. On the other hand, greater economic and technological development would help society deal not only with climate change, but other, higher priority problems simultaneous3ly. Although the paper doesn’t explicitly address the issue of whether the global temperature increase (∆T) ought to be limited to 2 °C above pre-industrial, the analyses presented in the paper indicates that human well-being under the warmest scenario (which is projected to increase ∆T by 4 °C above 1990 by 2085) is higher than under the cooler scenarios, despite substantially overestimating its net negative impacts (at least through 2200). Note that the net GDP per capita analysis on which this is based does consider environmental impacts and the risk of catastrophe, courtesy of the Stern Review. Finally, I have a request for the reader who my wish to post a question on this blog entry, please read the whole thing, because I’ll only be available sporadically to respond to questions. Thanks. Lorenzoni I, and Adger WN. Critique of Treatments of Adaptation Costs in PAGE and FUND Models. In: Warren, R. et al. eds. Spotlighting Impacts Functions in Integrated Assessment Models, Tyndall Centre for Climate Change Research Working Paper 91, Norwich, 2006, 72–79. See p.74. Parry ML, Livermore M., eds. A new assessment of the global effects of climate change. Global Environmental Change 1999, 9:S1–S107. Arnell NW, Cannell MGR, Hulme M, Kovats RS, Mitchell JFB, Nicholls RJ, Parry ML, Livermore MTJ, White A. The consequences of CO2 stabilization for the impacts of climate change. Climatic Change 2002, 53:413–46. Parry ML, ed. Special issue: an assessment of the global effects of climate change under SRES emissions and socio-economic scenarios. Global Environmental Change 2004, 14:1–99. Tol RSJ. The Social Cost of Carbon: Trends, Outliers and Catastrophes. Economics—the Open-Access, Open-Assessment E-Journal 2008, 2(25):1–24. US Global Change Research Program. 2009. Global Climate Change Impacts in the United States, Cambridge University Press, 2009. Cambridge University Press, Cambridge, page 18. Goklany IM. 2009. Trapped Between the Falling Sky and the Rising Seas: The Imagined Terrors of the Impacts of Climate Change. University of Pennsylvania Workshop on Markets & the Environment, December 13 2009. IPCC. Climate Change 2007: The Physical Science Basis. Cambridge University Press, Cambridge, 2007, page 17. Goklany IM. Is a Richer-but-warmer World Better than Poorer-but-cooler Worlds? Energy & Environment 2007, 18 (7 and 8):1023–1048. Goklany IM. Integrated strategies to reduce vulnerability and advance adaptation, mitigation, and sustainable development. Mitigation and Adaptation Strategies for Global Change 2007;doi:10.1007/s11027-007-9098-1. Goklany IM. Discounting the Future. Regulation 2009 (Spring) 32:36-40. Goklany IM. Have increases in population, affluence and technology worsened human and environmental well-being? Electronic Journal of Sustainable Development 2009, 1(3). Goklany IM. The Improving State of the World. Cato Institute, Washington, DC, 2007.
 van Lieshout M, Kovats RS, Livermore MTJ, Marten P. Climate change and malaria: analysis of the SRES climate and socio-economic scenarios. Global Environmental Change 2004, 14(1):87–99. Goklany IM. Deaths and Death Rates from Extreme Weather Events: 1900-2008. Journal of American Physicians and Surgeons 2009, 14 (4):102–09. Costello A, and University College London-Institute for Global Health and Lancet Commission. Managing the health effects of climate change. Lancet 2009, 373:1693–1733. McMichael AJ, Woodruff RF, Hales S. Climate change and human health: present and future risks. Lancet 2006, 367:859–869. Arnell NW, van Vuuren DP, Isaac M. The implications of climate policy for the impacts of climate change on global water resources. Global Environmental Change 2011, 21:592–603. UN Development Program. 2011. Frequently Asked Questions (FAQs) about the Human Development Index (HDI). http://hdr.undp.org/en/media/FAQs_2011_HDI.pdf (accessed December 23 2011). Sen A. Assessing Human Development: Special Contribution In: United Nations Development Programme (1999). Human Development Report 1999. New York: Oxford University Press, 23. UN Development Program. International Human Development Indicators, 2011. http://hdr.undp.org/en/statistics/hdi/ (accessed November 26 2011). Goklany IM. Could Biofuel Policies Increase Death and Disease in Developing Countries? Journal of American Physicians and Surgeons 16 (1):9–13. 24 Stern N. The Economics of Climate Change. Her Majesty’s Treasury, London, 2006. Finally some perspective on climate change. Without political or green doom spin it all manageable. Sorry, no end of civilization, man or the global ecosystem soon. I guess they haven’t gotten the memo over widespread vitamin D deficiency which is probably the worst of all when it comes to nutrition. Also, they really need to clarity on what high cholesterol is. It is very misleading. They need to break it down to 3 category – HDL, large LDL particle (harmless) and small LDL particle which is responsible for heart disease brought on by chronic high blood sugar level. High HDL level (over 50) is what you want for protective against heart disease. Dr. Mike Davis’ Track Your Plaque is probably a good place to get started over this. I would say that “climate change” and reducing greenhouses gases aren’t even close to being a top priority. I would like to see a thread where readers are invited to list their top 10 priorities for improvements on this planet. And how it breaks down as to specific goals vs general goals. Global Warming (Climate Change, Climate Disruption, whatever) is not a threat to humanity but the belief in Global Warming (Climate Change, Climate Disruption, whatever) is a severe threat to all peoples. Climate Change as an existential threat to humanity is quite popular in some quarters. In order for that to occur (defined by say, a death rate of 50%, even though that wouldn’t be genuinely existential), we have to have warming in excess of 20C IMO. And that would require a major tipping point triggering a big positive feedback we don’t know about – Polar ice loss wouldn’t do it. The reason I say 20C is most of the warming would be in cold places, at cold times of year. I can’t believe the tropics can get significantly hotter than they are now. I think the existence of such a tipping point very unlikely, but can’t be sure, in part because the climate models are so poor. Although, there are quite a number of models, they are all pretty much clones of each other. What needs to be done is funding of research outside the climate science club to investigate the possibility of such a tipping point – the exact opposite of consensus science. Very nice work, Indur, but I am not sure about equating ‘the number one threat to humanity’, with an existential threat to humanity. I can think of several existential threats to humanity, and warming in the range the IPCC predicts, isn’t one of them. A nicely done doc, to be sure! And biofuel is just one policy. All policies that raise the price of food and/or energy have a trickle down negative impact on the poorest among us; increasing disease and mortality. In the case of carbon mitigation, the cure is far worse than the disease! The response to the imagined climate problem is akin to chopping off the whole leg to cure what is no more than a mosquito bite on the little toe. [Q:] Are there “alarmists”? Is that a good term? [Zorita:]Yes, I think there are alarmists, if by that term we include those that see anthropogenic forcing behind every change we see in the environment. Perhaps alarmist is not the right term. I would rather use the expression ‘climate hypochondriacs’. Now I really like that one.. can we all start using it , please? It really puts them on the correct level. On the time-scale of human evolution it is more likely that humanity will suffer more depopulation as a result of another Ice Age before a large depopulation caused by a collision with an extra-terrestrial entity. In that context the answer to the above question is yes. No amount of war, poverty, drought, hurricanes, floods, volcanoes and tsunami could ever cause as much harm to humanity as a 3 mile thick slab of ice covering the earth food growing regions for generations. Given the duration of the event an Ice Age may be in fact more devastating to humanity then a strike from a Manhattan sized object. The question about the question is; what exactly does the asker means when they use the term ‘Climate Change’? If you change the perspective then right now the support of climate change is indeed the number one threat to humanity. If you add up the amount of money spent on this farce world wide over the past ten years or so and work out how much damage the removal of such money from the world in terms of medicine not provided, clean water not available, simple medical procedures not carried out and the damage to real ecological concerns then in that sense climate change is indeed the biggest threat but not for any of the reasons the warmists may cite. Add in the long term damage to the reputation of science and scientists in general and there is little left to argue except for the reduction in standards of living because electricity is not available. I shudder to think of the total of this in terms of real lives lost, in particular of children, due to what was missed because global warming and climate change received the funding instead. Although I can’t give correct attribution to the originator of this comment, it has been stated that far and away the leading cause of human mortality in the 20th Century (and most centuries before that it was certainly a large, if not always the largest contributor) was being killed by your own government/monarchy/junta, either directly by murder or mayhem for political ends, or indirectly in the name of your government at the hands of yet another government. Climate deaths are, were, and always have been small potatoes in the broad scheme of things, dwarfed by politics and by disease, with 2 million entirely preventable deaths p.a just from malaria alone. Most deaths due to starvation or poverty are really geopolitical in cause, with the 1970’s Ethiopian situation a case in point with civil wars and government callous disregard for its own people the main contributors. In a modern technologically advanced world with access to proper sanitation, high quality medicines and high quality domestic building infrastructure, the proportion of deaths possibly attributable to climate is rapidly diminishing, not increasing. As disease declines due to Western medicine and research, the proportion of human deaths due to geopolitics is likely to increase exponentially, perhaps dare I say even to reach a “tipping point”. So, the number one threat to humanity- one word- “government”. The solution simplistically would seem to be- less government. “climate hypochondriacs” — I like the ring of that too, more accurate of a description, “warmists” always seemed a bit lacking. Consider that all of the 7 billion alive today will all be dead in about 75 years. That is about 93 million per year. The Second World War killed about 50 million in seven years, about 7 million per year, that is more than an order of magnitude less than Nature. Why do people continue to believe that the actions of humans can come anywhere close to the forces of nature? “..it has been stated that far and away the leading cause of human mortality in the 20th Century…”, and likely it has been often repeated by people like you, but that does not make it true. Climate change contributed to a fivefold increase in weather-related natural disasters in North America over the past three decades, according to Munich Re, the world’s biggest reinsurer. Increases in climate change-related hazards aren’t automatically reflected in premiums, the reinsurer said. AUSTRALIA and France have developed a plan to protect 1.9 million square kilometres of east Antarctica as new marine parks, although a report today will call for an even larger reserve. The Antarctic Ocean Alliance, a coalition of global conservation groups, will today release a report welcoming Australia’s plan but arguing it should be expanded to 2.5 million square kilometres. Already in 2004 the Copenhagen Consensus led by Bjørn Lomborg, a skeptical environmentalist, arrived at a surprising result: climate change was not a high priority. See http://bit.ly/RFmwb1. And in the following repeats similar outcome have been produced, the last in 2012. See http://bit.ly/RI8LvB. The only action proposal that is somehow linked to climate is the investment in R&D to be made to increase agricultural yields (i.e. tons per hectare). With exception of The Economist the media did not report on these quite sensible approaches. They may look too heretic even if produced by panels composed of undisputable personalities. Well I would say yes; climate change IS the number one threat to humanity. And if we can’t get these warmist nut jobs off their public trough swilling binge; perish the thought they might even do something useful; we will all be going over the cliff with them. Well the single greatest scourge to ever inflict the human race is of course something else we here about every day; but climate change runs that a close second. I think we are at cross purposes. My statement was referring to mortality that was in some way premature or taken over and above regulation levels, ie a threat to human survival as the paper above is referencing with respect to climate. I don’t believe the article was referring to old age, degenerative conditions or non-communicable diseases, or other forms of human mortality which form the norm. Stalinism, Lysenkoism, Mao’s cultural revolution, WW1 and 2, Pol Pot, various ethnic cleansings, and other similar political purges around the globe removed young, vital and healthy people who would otherwise have lived full and active lives contributing to society. They I’m sure would have all died eventually, but that is hardly the point is it. We are talking about attribution of deaths outside the norm for so called climate change as opposed to other AVOIDABLE causes. Governments as a cause of death are avoidable (through eg. separation of powers and a free unbiased press among other things), climate change is a storm in a tea cup whose worst case scenarios, as unlikely as they are, can be mitigated against rather than attempting a King Canute approach. Death due to natural causes is not only unavoidable, but necessary from a species perspective. I really like Anthony’s concept to actually look at what this Climate Change, Global Warming industry has created in our minds. He has put into perspective what a recent Australian Prime Minister called “greatest moral challange of our time”. CAGW certainly isn’t that and Anthony’s message needs to be spread far and wide. Thank you Anthony for working this thing through. Your analysis should have resounding implications on the AGW consensus. And may I say your efforts are really appreciated down here in OZ. Is making the planet’s population much wealthier and better feed the number one threat to humanity? Apparently so, for a warmist. BTW, the always-accurate UN Population Survey’s ‘Low Band’ projections say peak around 2040 at >8 bn., declining thereafter. (3) that Darwinian evolutionary theory is operative. (5) that Homo sapiens has considerable current and potential to have an impact on evolutionary pressures. (6) that societies can, in the broad, be divided into wealthy and poor. (7) that a change in the current genetic profile of humanity represents the evolution of a new humanity, if not (yet) a new species. I acknowledge that these are assumptions and are open to considerable discussion. In general, the wealthy are going to be the last to be affected by any negative climate change (whether natural or anthropogenic). They will be able to buy their way to higher land, to being first in the queue for nutrients and potable water, and first in the queue for medical services. The net result is that wealthy individuals usually survive for long enough to pass on their genes. The wealthy, therefore, have virtually no genetic selection pressures arising from climate change. Their part of the H. sapiens gene pool is, therefore, unlikely to be affected by climate change. But there is a paradox: the pattern in nearly all societies is that the wealthy are less likely to pass on their genes than the poor. They raise fewer children. In fact, if the wealthy did not recruit new members from outside their gene pool, they would go extinct as a human group for lack of replacement recruitment. That leaves the potential genetic impact of climate on the poor individuals of H. sapiens. There is virtually a one-to-one relationship between being very poor and going hungry. (Depending very much how you count them, there are around 1 billion people who are poor enough to go to bed hungry every night.) But being hungry does not necessarily mean that poor individuals fail to pass along their genes. But occasionally (and more and more frequently) this background hunger escalates into famine and mass deaths from starvation. A cursory glance at the results of droughts in particular reveals that there are considerable selection pressures. The combination of drought, disease and famine (often made worse by wars arising from competition for scarce resources) may lead to mortality of many individuals. Significantly, the mortality is often highest amongst those who have yet to have an opportunity to pass along their genes: children, of whom around 5 million are reckoned to die of hunger and hunger-related diseases a year. Let us assume that the death of children in droughts is not random and that there is a climatic component to the selection pressures. It follows that the genetic composition of drought survivors will reflect successful genes, for example, the ability to withstand extreme temperatures, the ability to withstand both hunger and disease, the ability to withstand low nutrient levels. Such survivors will reach adulthood and pass along the successful genes. It follows that if there are more extreme climate events and/or there are consequent trends in the cost of nutrients and water, then H. sapiens will adapt, genetically. Any increasing trends in climate selection pressures would have the impact of speeding H. sapiens’ evolution. There is considerable complexity. There are plenty of examples of species which have extremely limited genetic range, often related to a climate-related bottleneck – an ice age. Such species are, typically, highly vulnerable to new selective pressures, lacking as they do the genetic range from which to adapt. OTOH, it is arguable that the within-species genetic range of H. sapiens allows for considerable adaptive potential. Then there are extinctions, 99% of all species are thought to have become extinct. At higher levels of classification, many extinctions coincide with the five major extinction events. Of these several relate to a high degree of rapid chemical change in seawater associated with methane increases. If, whether for natural or anthropogenic reasons, the clathrates mobilise, the tundra thaws and natural methanes become unblocked in a short event, then those H. sapiens which depend on the 100 million tons of wild caught food for their protein are likely to face intense selection pressures. Those who are adapted to a smaller proportion of protein in their diets are likely to pass along their genes. At any rate, H sapiens would adapt, genetically, to a mass methane release. Clearly, part of our understanding of the climatic impacts on our gene pool depends on whether certain thresholds and certain runaway feedback events occur. Finally, the evolution of H. sapiens is occurring with the evolution of other species. These may be affected by climate change and may well have a compounding impact on human evolution. H. sapiens is already adapting genetically to climate through selective pressures on poor people, particularly in areas where droughts already kill children. Whether the quantity and quality of climate selection pressures force adaptations that are far enough and fast enough to create a new Homo species is open to considerable conjecture. Given the considerable complexity in issues relating to adaptation, it is impossible, to rate climate change as a threat comparative to other threats to H. sapiens. The bottom line, however, is clear: through adaptation to climatic selective pressures, H. sapiens is already adapting. Large scale and rapid changes to climate are likely to speed the selective pressures and the rate of change on the H. sapiens gene pool. If the anthropogenic global warming theory holds, then the genetic future for H. sapiens may well be where it started: in the drier areas of Africa. As a paradox, the wealthy of New York, Beijing, Moscow and New Delihi are currently making little current adaptive contribution to H. sapiens adaptation to climate change and are less likely to do so in the future. Of course, Dr. G., what further reduces much of the above to irrelevant incoherence is ceding the assumption that CO2 has more than bubkis* to do with temperature. It does, of course, enhance agriculture (its only documented effect). *technical term, meaning “squat”, “nothing whatsoever”, etc. I would very much like to be able to re-post this article to another site, or at least a portion of it. All the proper credits and links would of course be put into place. The site in question is deviantart.com. It is an art site, but very heavily populated by those who believe in ‘man-made’ global warming. There are, at least, a few there, who appreciate this kind of information. The True Believers, not so much. At this point I am the ONLY one who posts anything on the Skeptic side of the issue. I’ve asked similar permission of Dr Pielke Jr, Pointman, and several others who’s names escape me at 5am in the morning. I think climate change is the number threat to humanity in the 21st century, since it affects many other sectors as well. Humanity is dependent on climate, therefore everything then ties in together, like the inequalities between different countries and within countries. This also links to povery, crime rate, the economy and more. For example third world countries mostly produce raw materials and export it to developed countries. If the economy of the most developed counties like Britain were to fail due to climate related issues like catastrophic hurricanes, the poor counties will be directly influenced by those events. Unless things are done sustainable from on, we might be facing an anthropogenic human extinction in the near future. I think the biggest threat to humanity is humanity itself. Why can we not learn from history? They seemed to have overlooked a global pandemic such as influenza e.g. Bird Flu and Swine Flu which have the potential to reduce the world population by significant amounts. The 1918 Spanish flu took 50 million people, and that is without the social mobility we have today. Not many people travelled by aeroplane in those days. We also have a rise in antibiotic resistant bacteria which again could easily wipe out large sections of the population. I think these scenarios are much more serious than the threat of as yet unproven extreme global warming. I am not sure where you obtain your information about their world countries, and I specifically focus on East Africa here, but you are seriously misinformed. Anyone in these countries involved in export typically are not locals, unless they are Govn’t offcials etc. The wealth extracted is, indeed, exported and none of the locals benefit at all, or very little, from that resource export. Many are simply existing trying to find enough money to buy the next meal and even some who actually do work and get paid relatively well in comparison, still struggle to make ends meet, so many go hungry. Many are also forced, by corrupt corporates/officials/govn’t, off their lands so that food can be grown for biofuels. Climate change has nothing to do with the poverty, crime rates and economy in Ethiopia for instance. Most of the debate surrounding global warming is in the form of thousands of peer-reviewed scientific papers. Such papers typically lack sarcasm, emotion, irony and ad hominem attacks. They are often written in the second person and also use the passive voice. The tone is usually dry and the general approach is to dampen emotions and to encourage rational discussion. These attributes apply regardless of which theory the scientific authors subscribe to. A lesser proportion of the debate occurs in blogs. Certain blogs, and associated strings of commentary, may have ‘tribal’ characteristics: in-groups, the use of sarcasm, the use of ad hominem pejoratives, inflammatory us- or -them language, the use of sarcasm, ill-judged attacks about the motivation of others, other elements characteristic of paranoia, cherry-picking of data, misrepresentation of data, profound distrust of others and a general lack of rational scientific discussion. IMHO, this is a small (if disproportionately noisy) proportion of the entire global debate about climate. Tribal members also use key word terms such as ‘warmists’ and ‘deniers’. These terms are not scientific and are essentially meaningless other than as tribal identifiers. As for the public debate represented in the mainstream media, it is difficult to characterize it even as ‘tribal’. It is certainly not science and mostly lacks anything that resembles rational ‘debate’. Much better, in general, to write it off as mere entertainment. As noted above the mass of thousands of scientific papers is dispassionate. Most of these papers are written by those who support the theory that anthropogenic global warming trends sit on top of climate trends caused by natural causes. The willingness to engage in the science is clear. ‘contrarian’ to what? Usually the explicit or implied meaning would be contrary to a generally accepted position or consensus. If this is the intent of the writer, then a brief acknowledgement of the consensus would be useful to clarify what is meant. Unless things are done sustainable from on, we might be facing an anthropogenic human extinction in the near future. If your assertion is true then it is clearly important and requires that “things are done sustainable”. Please define “sustainable” so we can know what to do. 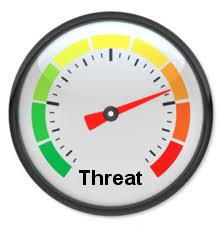 “Threat” does not equate directly with risk. An asteroid the size of Oklahoma is a greater threat to humanity. But most unlikely. Climate change, in the form of a 4C LOWERING of global temperature, is a great threat, and it is somewhat LIKELY. Therefore, CLIMATE CHANGE IS the number one threat to humanity. Not what the warmists are pushing, but still real. Will it happen in 100 years? A 1000 years? No one knows. “As Britain battles through floods and major transport disruption, and the nations gear up for the UN climate conference at the Hague, how can responsible businesses and organisations prepare for climate change? “We have changed our environment significantly throughout our history. Global climate change poses a different type of threat: the rate of warming already exceeds anything experienced in the last 10,000 years. But can we survive this dramatically changing climate and are the Earth’s ecosystems resilient enough to survive in their current form given the other pressures they are subjected to by human development? change research strategy Dr Rowan Williams the Archbishop of Canterbury is tomorrow helping the UK’s Tyndall Centre for Climate Change Research launch its new research strategy. “The Government has only four years to implement a major new programme of action to cut carbon emissions if the UK is to play its part in keeping global temperatures below danger levels warned a new report launched by The Co-operative Bank and Friends of the Earth today. As our energy costs in the UK continue to escalate and we are at risk of blackouts in the not too distant future, I say thank you Professor Hulme, thanks a bundle. On Oct. 15/87 a BBC weatherman famously dismissed any rumours that a hurrican was on its way to souther England. Scientifically he was correct, but Souther England still suffered the worst storm since 1703 and 4th worst since records began. Such a storm is only predicted to occur in the United Kingdom once every 300 years. Since 1987 the number of recording stations and the use of satellites has increased greatly. It is unlikely that the UK would be caught out in such a way again! The Gream Storm of 1987 was not officially classified as a hurricane by meteorologists as is was gusts, not sustained winds that reached hurrican force. On the Beaufort scale, a Hurrican Force wind (Force 12) is defined at 64 knots or more for a period of at least 10 mins. Gusts of wind, which cause most of the major damage, are not included in the classification of hurricanes. In 1987 a top wind speed of 70 knots over 10 mins., was recorded in Hampshire, but this was only an average and could therefore not be classified as hurricane force. Although not defined technically as a hurricane, gusts up to 122 MPH caused havoc and extensive damage across London and the Home Countries. A total and unequalled 15 million trees were lost, including 6 of the famous oaks at Sevenoaks. 18 people were killed. London lost power for the first time since the Blitze and 1.9 billion pounds of damage was caused. A ship capsized at Dover and across the channell a ferry was blown ashore near Folkestone. 90% of Kent’s roads were blocked due to fallen trees and other damage. The Great Storm of 1987 coould have claimed many more than the 18 lives if it had hit Southern England during daylight hours. So tell me, jennyR, WHERE ARE ALL THESE CATASTROPHIC HURRICANES? BTW, those 3rd-world countries will benefit from increased warmth, and be able to export even more. The four horses of the environmental apocalypse can be succinctly described by just four P’s: Population, Poverty, Politics and Pollution – none of which can be solved in isolation. It’s how they connect that matters. NEW YORK, Oct 18, 2012 (AFP) – Climate change caused by global warming is freezing the world economy and already leading to the deaths of millions every year, a report commissioned by 20 of the world’s most vulnerable countries said Wednesday. “Climate Vulnerability Monitor: a guide to the cold calculus of a hot planet” says global warming will not only lead to environmental catastrophe, but is choking the international economy. Key findings include estimates that carbon-intensive economies and associated climate change are responsible for five million deaths a year, 90 percent of them related to air pollution. “Failure to act on climate change already costs the world economy 1.6 percent of global GDP amounting to $1.2 trillion in forgone prosperity a year,” said the report, produced by the DARA research center and released at the Asia Society in New York. In addition, “rapidly escalating temperatures and carbon-related pollution will double costs to 3.2 percent of world GDP by 2030.” According to the report, “unprecedented harm” is being inflicted on humanity. However, tackling climate change’s causes would bring “significant economic benefits for world, major economies and poor nations alike,” the report said. Former Costa Rican president Jose Maria Figueres said at the presentation that there is a “fantastic” opportunity in steering away from carbon-intensive economies. “There’s a tremendous amount of opportunity in terms of development around the world as we reinvent everything,” he said. “This is where the future is.” Anything less, he said, is “in some ways similar to rearranging the chairs on the deck of the Titanic.” The report says that while poorer countries face the steepest economic damage in terms of GDP losses, big countries will not be spared. “In less than 20 years China will incur the greatest share of all losses at over $1.2 trillion. The US economy will be held back by more two percent of GDP; India, over five percent of its GDP,” the report said. It said these projected losses “dwarf the modest costs” of addressing climate change. Jeremy Hobbs, executive director of the aid agency Oxfam International, called the report “another reminder that climate change’s most savage impact is hunger and poverty.” “The economic and social costs of political inaction of unchecked climate change are staggering,” he said. “Behind the statistics are the stories of real families and communities, for whom climate change means putting children to bed with empty stomachs.” Bangladeshi Foreign Minister Mohamed Mijarul Quayes told the forum in New York that radical change from carbon-heavy economies is the only way forward. “There’s no plan B, because there’s no planet B,” he said. Climate change? Isn’t that code for Anthropogenic CO2-driven Catastrophic Global Warming? That train has left the station. Oh well. If someone is really concerned about rising sea levels swamping Florida, I’m looking for a retirement property there. I suppose you can convince me to take that risky property off your hands before the sea reaches the windowsills. If the price is low enough, I’ll assume the risk. 1. Malaria infection could be eliminated in a decade if DDT is just used very sparingly (say, twice a year) on interior house walls. Sadly, DDT is a ‘3rd rail’ for gutless politicians and environmental groups scared of elitist contributors. 2. All of your analysis ought to be built on GDP/person, wealth/person, and income/family — three factors having huge impacts on ALL projections — everything! 3. ‘Climate change’ (CC) is nonsensical Orwellian terminology. Why not be a refreshingly correct academic pioneer with your grammar! Try ‘natural climate change’ (NCC), and ‘anthropocentric climate’ change (ACC). 4. Life expectancy (therefore population projections) are laughably low in view of proven but not yet commercialized (except by your dog’s vet) pluripotent stem cell technologies. 5. It is a strange oversight to not address the unavoidable political turmoil already resulting from the collapsing job base in advanced nations caused by robotic manufacturing and robotic retail services. 6. Academic papers relying on Stern’s ridiculously low discount rates go in real world trashcans. 7. The impacts of proven trends and not yet commercialized technologies are grossly underestimated —e.g. internet impact on de-urbanization of housing/workplace patterns; the impact on food supply of drip irrigation and ocean food production; the impact on water supply of desalination of sea water and ultra-deep ground water; and the impact of televised internet education. 8. Failing to acknowledge the long term energy shift to huge supplies of cheap ‘fracked’ natural gas is a big flaw. 9. Failure to acknowledge collapse of the AGW hypothesis (and the minimal influence of CO2) seriously undermines the editorial’s credibility. The inimitable Joe Romm has provided us with a ‘An Illustrated Guide to the Science of Global Warming Impacts’ at http://theenergycollective.com/josephromm/124636/illustrated-guide-science-global-warming-impacts-how-we-know-inaction-gravest-thre. •Permanent Dust Bowl conditions over the U.S. Southwest and many other regions around the globe that are heavily populated and/or heavily farmed. •Massive species loss on land and sea — perhaps 50% or more of all biodiversity. •Food insecurity — the increasing difficulty of feeding 7 billion, then 8 billion, and then 9 billion people in a world with an ever-worsening climate. Luckily, I am 64, so am unlikely to live long enough to enjoy his predictions. There are bigger issues, and at a macro (food, fuel) not micro (malaria) level. The arguments are laid out in an easily comprehended, viscerally factual manner in the recent ebook Gaia’s Limits. Places potential climate change into a broader global context. The relationship between art and science is an intriguing one. My opinion is that science is a form of art, say an art of the mind, as science cannot do without the mental constructs they call theories and hypothesis which need the creative mind to develop. The problem here is that “global warming” both with the general public and many artists (most?) is not considered to be a scientific topic, it is mainly a political topic. As even “among scientists” themselves already it is pretty difficult to have a decent and open-minded discussion about so called “climate change”, you would not expect an art-site to be a fruitful forum for this topic. Also, art usually is presented “as is”, without open minded discussion. Spanish flu is a misnomer- the pandemic originated in France in WW1 due to the atrocious conditions livestock were kept in in the war zone, with different species living in cramped and unhygienic conditions. It decimated the German army in particular. Once again, the pandemic and it’s death toll was an indirect result of governmental malfeasance, a war that didn’t need to occur had he will been there to avoid it. Most of the world’s hunger also requires at the minimum governmental indifference, at worst deliberate government policy. Patrick is right- this side of an Ice Age, which as Andrew states correctly is a game changer of a whole different kind, mankind’s single greatest danger is mankind itself. Climate Alarmists are among the greatest threats to Humanity. Your own ignorance of climate and the destructiveness ofmindless utopion or distopian activism is one such example of how the threat is supported by negligence of reality. Your post at October 18, 2012 at 2:40 am makes many statements and almost all are debatable. I suspect the depth of your knowledge is revealed by your saying this. The AGW hypothesis is about anthropogenic global warming. Global warming will increase the frequency of such global pandemics, there is a link between the two. That is why AGW is far more threatning. I shudder to think of the total of this in terms of real lives lost, in particular of children, due to what was missed because global warming and climate change received the funding instead. The US manned space program has been stagnate for 40 years as a result. The moon missions were cancelled and the budgets reallocated. The telescopes were turned inwards to study “mission earth”. In order to justify the money being spent, they had to find a problem to be solved. AGW was the solution. A great deal of our modern technology grew out of the space program. AGW has produced windmills, high cost electricity, Kyoto and carbon taxes. The net result has been to drive manufacturing from efficient first world countries (US, EU) to less efficient third world countries (India, China). This has actually increased global CO2. over what it would have been otherwise. The exact opposite of what it was supposed to accomplish. At the same time this shift in manufacturing has put massive budget pressure on the US and EU governments, bringing both to the brink of financial debt crisis which threatens to plunge the world into economic chaos that will make the depression of the 1930’s look like good in comparison. As in the 1930’s war and death will follow as the countries of the earth try and ward of starvation. The former Soviet Union collapsed because it placed belief ahead of reality. They put their faith in an unproven economic theory and it brought down their house of cards. Now the same pattern is repeating itself with global warming. Nations are placing their faith in an unproven climate theory and the warning signs are clear. Those that ignore the lessons of history are doomed to repeat them. When you sow the wind, you reap the whirlwind. I suppose that we must give a reason for warring groups. It can’t be religious, political, and economic differences. Why do we “war”, because it is simpler and less boring to “war [steal]” than it is to grow your own food [and be bored] . Modern irrigation, fertilizers, crops, and techniques will supply food for many times the world’s population; but that is slow and boring. How can I have power, a palace, a jet plane, beautiful women, exotic foods and entertainment quickly unless I steal [includes taxation] ? Maybe the real reason for the fall of the Roman Empire was that they got “bored” with power! What game does one contrive, when you have it all, to not be bored? Let us not blame it on human nature, let us blame it all on “climate change”. Let us say that the Industrial Revolution started around 1850 [advent of the beginning of automated transportation [trains]. The Industrial Revolution [with automation] has a natural ending when all muscle labor has been replaced by computers/robotics. IBM/Intel stated that by 2050, we will have the power of a “human brain” on our desktop [or in our laptop, or our iPad]. Today, a modern farmer in America, using GPS, can start tractor 1 to plow field 1. He can then start tractor 2 to plow field 2, etc. He doesn’t need to even monitor tractor 1 with all of the safeties. Maybe one man can take care of 20,000 acres. When the tractor can drive itself to the field, maybe one man can take care of 100,000 acres. The cows come in and the automated milkers milk them. Yes, we will need maintenance people for a while; until they are replaced. The simple automation in modern factories has eliminated 75% of the workers, on its way to 90%. Automated retail [Amazon, etc.] will reduce retail workers by 90%. Maybe “climate change” is the justification for a massive war to temporarily reduce human population. We can then say, “That war was due to climate change”. The real issue is no jobs, but many more people. [ . . . ] Reduced economic development, in particular, would be a bigger problem, especially for developing countries. And if climate change policies compromise such development, they too can become problems despite the best of intentions. On the other hand, greater economic and technological development would help society deal not only with climate change, but other, higher priority problems simultaneous3ly. Once again I am impressed with the strategic skill you implement in posing the issues and also the impeccable logic of your argumentation. When i’ve read your work over the last decade, I am often happily reminded of the work of Julian Simon. A profound sense of human optimism is created by you like that created by Julian Simon. The Roman Empire failed due to a variety of problems including: totalitarian government concentrating economic decisonmaking authority into the hands of too few people who were also too incompetent and not accountable for their failures; incompetent military leadership,; the conquests by the Germanic tribes; and the islamic conquests of the Mediterranean agricultural resources and trade route lines of communication; and pandemics. Natural changes in climate exacerbated the other challenges to the empire. Anthropomorphism … is any attribution of human characteristics (or characteristics assumed to belong only to humans) to other animals, non-living things, phenomena, material states, objects or abstract concepts, such as organizations, governments, spirits or deities. Hansen et al., Climate change and trace gases. Phil. Trans. Royal. Soc. A, 365, 1925-1954, doi:10.1098/rsta.2007.2052. Paleoclimate data show that the Earth’s climate is remarkably sensitive to global forcings. Positive feedbacks predominate. This allows the entire planet to be whipsawed between climate states. One feedback, the “albedo flip” property of water substance, provides a powerful trigger mechanism. A climate forcing that “flips” the albedo of a sufficient portion of an ice sheet can spark a cataclysm. Ice sheet and ocean inertia provides only moderate delay to ice sheet disintegration and a burst of added global warming. Recent greenhouse gas (GHG) emissions place the Earth perilously close to dramatic climate change that could run out of our control, with great dangers for humans and other creatures. Hey kids – let’s do the albedo flip!! I think a more appropriate question would be whether climate warming was the 1,387,952nd worst threat, or the 2,754,154th worst threat to humanity. Where/how do you get these!? You wrongly presume “Global warming will increase the frequency of such global pandemics,” whereas the historical evidence indicates colder temperatures increase the occurrence of pandemics while warmer temperatures decrease the rate of pandemics. You neglect to note the reality that Anthropogenic Global Warming (AGW) is a barely perceptible or measurable effect with practically no material contribution to natural climate change or natural global warming, or provide any credible scientific evidence to demonstrate otherwise. Instead you presume to DICTATE the existence of a problem which science indicates almost certainly does not exist and continue on to DICTATE an impossible solution to the nonexistent problem. Having played the role of a DICTATOR in creating a nonexistent problem, you proceed to advocate the destruction of the very economic infrastructure Humanity uses to adapt to the environment and prevent the otherwise natural occurrence or unnatural occurrence of pandemics. It can be fairly argued that you are advocating the wholesale destruction of tens of millions of human lives by the destruction of the infrastructure required to support those human lives. You threaten this mass destruction of humanity because you are too lazy, too arrogant, and too negligent to learn and understand the science under discussion before advocating such mindlessly destructive policies. I’m not any sort of economist or socialist, so I can’t make any significant comment on those aspects, but I am a biologist and an environmentalist, and there are some things that I don’t agree with this article. First off, it seems you’re ignoring the indirect effects climate change has on human welfare; the heat isn’t killing anyone, but the expansion of deserts into previously arable land forcing farming communities to poverty very well could be. Climate change and global warming is certainly going to result in an intensification of the weather cycle (increase in the frequency of floods and extended drought periods) will undoubtedly effect humans in various ways. This intensification will make water scarcer as it will be much more difficult to store as it arrives in large amounts in a short period, simultaneously increasing erosion and runoff. The biodiversity, also, is more likely to decrease. It is true that the productivity is projected to increase, but due to the differential fixation of carbon dioxide by different plant species, the increasing concentrations of this gas should result in a competitive advantage of certain plants over others and ultimately excluding them from their ecosystems. An example of this is bush encroachment on Savanna regions. The loss of biodiversity has many implications on the wellbeing of humans, especially in poor areas where ecotourism is driven by high levels of biodiversity. Personally, I think that emperor Constantine put the largest nail in the Coffin when he declared Christianity as the official religion. The empire was based on slavery. And the most cruel methods to keep the slaves on place. Remember the story of Spartacus? When they crusified, 6000 slaves along Via Appia? You can’t do that, and be a Christian at the same time. All of your pronostications are suppositions with no observational proof that any of these things are 1. happening or 2. causally related to any human activity. The climate is always changing and will continue to do so with or without people. Nothing short of depopulation will have any effect upon what insignificant contributions, so far unproven, man has had upon the climate. the expansion of deserts into previously arable land forcing farming communities to poverty very well could be. Which deserts would those be? The Sahara is shrinking. More problematic for “arable land ” is their use for biofuels which has already resulted in food riots. Historically I see no correlation in your study when compared to real history. Humanity thrives in warmer climates. Compare warmer periods to the little ice age. Our modern technology is not up to par to live well in the coldest places on the planet, such as Antarctica, where as Palm Springs, or Las Vegas we are functionally adapting to. A casino sin city with all the entertainment trappings in the middle of any warm desert can be dealt with, but not the cold dry deserts. Too simple??? ‘Climate change’ represents no threat to humanity, as it is the normal state of things. One of the greatest threats to humanity is undoubtedly politicians listening to ‘climate scientists’, as the latter’s solution to the non-problem of ‘climate change’ is economic Armageddon, whilst retaining positions of privilege for themselves. I’m not any sort of economist or socialist, so I can’t make any significant comment on those aspects, but I am a biologist and an environmentalist, and there are some things that I don’t agree with this article. First off, it seems you’re ignoring the indirect effects climate change has on human welfare; the heat isn’t killing anyone, but the expansion of deserts into previously arable land forcing farming communities to poverty very well could be. Your first error is in presuming humans have the ability and actually have been responsible for making the Earth’s climatee warmer. 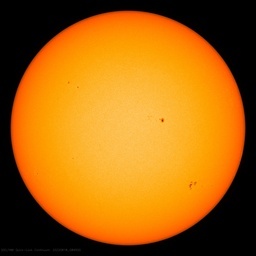 Perhaps you have allowed yourself to be indoctrinated into the false assumption and false belief that Anthropogenic Global Warming (AGW) exists greater than an insignificant and non-material extent, but that is no excuse for your disregard of the scientific evidence indicating we experienced natural warming and are now experiencing natural climate change with naturally cooling temperatures. Your second error is in presuming increased planetary temperatures are responsible for the “ expansion of deserts into previously arable land,” when it is colder planetary temperatures which result in the expansion of deserts as a consequence of the cryosphere sequestering water and thereby reducing the water available for precipitation. Increased planetary temperature increases the rate of evaporation and precipitation, which increases humidity, rainfall, and biodiversity. Climate change and global warming is certainly going to result in an intensification of the weather cycle (increase in the frequency of floods and extended drought periods) will undoubtedly effect humans in various ways. This intensification will make water scarcer as it will be much more difficult to store as it arrives in large amounts in a short period, simultaneously increasing erosion and runoff. The biodiversity, also, is more likely to decrease. All of which is exactly contrary to scientific observations of reality. If you think otherwise, you are welcome to find the scieentific evidence necessary to refute the scientific papers and discussions on these same topics in this blog, wattsupwiththat. It is true that the productivity is projected to increase, but due to the differential fixation of carbon dioxide by different plant species, the increasing concentrations of this gas should result in a competitive advantage of certain plants over others and ultimately excluding them from their ecosystems. An example of this is bush encroachment on Savanna regions. The loss of biodiversity has many implications on the wellbeing of humans, especially in poor areas where ecotourism is driven by high levels of biodiversity. Radical changes in biodiversity is a normal result of natural biology. The presence of humans does not change that reality, even when humans have some material or non-material influence upon the biodiversity. The biosphere is not a static object. The biosphere is a very dynamic object. Attempts to assert that humans must somehow take full or substantial responsibility for natural climate change and natural changes in biodiversity are irrational at best and unscientificat least. Climate Change as the #1 threat? Are you kidding? Nothing scares me more than the though of a viral epidemic spread by air travel. A close second is a wheat or corn rust that hits a monocultured grain belt. Jurgen~ Very interesting idea, will see what I can do! Thanks! Being a cross disciplinary student in both social and environmental sciences this paper is both heartening and disheartening at the same time. As social science student, it is good to see that the stressors that affect people such as disease, poverty, shortages of water, economic development issues etc. take precedence over climate change. However, this piece of work is disheartening in that is shades climate change in such a way that it almost makes it seem irrelevant and almost more of a slight issue instead of a real problem. This article, in a sense, seems to sweep climate change under the carpet. The article also seems to take the good that people are doing in terms of trying to offset emissions and making them seem worse than what they are. Case in point is the biofuel debate, yes it might increase the price of food, but it will lower the amount of GHG’s emitted and it may teach people not to waste the food that they have. A couple of months ago I read that in the UK, almost 4 slices of bread is thrown away everyday simply because the people do not eat the end slices of the bread once its cut. Also we find that certain farmers and corporate will rather dump produce instead of sell it at a discounted rate simply because the produce is not the correct shape, so I think we should be looking at corporate and asking them what they are doing to try and minimalise the wastage of produce as well as what they are doing to offset emissions as well as how are they helping to improve the underprivileged that live in degenerated areas. Don’t get me wrong, the author of this piece has done a really good job in highlighting and interpreting the data from the ar4 and various other works from the IPCC. I also agree that climate change is not such an immediate problem such as reduced economic development; however climate change isn’t something that can be fixed or mended or put on the shelf because there are definite climate shifts. In Cape Town we are getting colder, dryer summers and hotter summers I mean in the next 20 or so years we should be expecting 40 degree Celsius summers which is very uncomfortable and will definitely hinder economic development then. It all comes down to how can we adapt or mitigate the effects of climate change now, so that when it does get worse we will have adequate contingency plans in place to help those who are the most vulnerable and those who will suffer the most i.e. the poor. In my opinion this article highlights the contemporary issues that are plaguing mankind but it will get a lot worse if climate change is swept under the carpet. There are four main problems in any discussion in relation to prevention v adaptation as over-arching policy settings in relation to anthropogenic global warming theory. I bound my discussion within the next 200 years. I assume that the discussion is loosely based on anthropomorphic global warming trends superimposed on natural climate trends and cycles on the one hand, and natural climate trends and cycles on the other. The four main problems are now discussed. (1) setting a useful time frame to bound the policy discussion. Any discussion between prevention and reaction needs to be time-bounded. 10 years? 50 years? a century? two centuries? a thousand years? The time horizon of all policy discussions is critical. Quite a few blog comments imply a near-future or present time horizon. A lack of a time horizon renders policy discussions between prevention and adaptation meaningless. Applying the time horizon test, quite a few of the above posts have no meaning. I note in passing that a significant proportion of unfunny sarcastic and useless posts, including some upstring, make senseless assumptions about time horizons. Adaptation v prevention discussions need to time-bounded. (2) costing adaptation is extremely difficult and has yet to be done in a comprehensive and convincing fashion. One example. One quarter of the Netherlands is below sea level. Another half of the Netherlands is a metre or less above sea level. The Dutch are investing heavily in adaptation to proof the nation within a century against a one metre rise in sea level. However, costs for proofing against a two metre rise in sea level are exponential. It is not simply a matter of adding a metre to the top of a dyke. The base and the entire mass of the dyke has to be strengthened, because it is water pressure at the base that is more likely than over-overtopping to cause a breach. Assuming adaptation and rising sea levels, sooner or later the Dutch economy will be unable to continue supporting these exponential costs. The Netherlands has the world’s 16th largest economy. In terms of costing adaptation should the Netherlands economy be deleted? There would, of course, be massive economic flow-on effects: Rotterdam is europe’s largest port, with around 150,000 vessel movements a year, and ports function badly when under water. The port infrastructure is highly sophisticated and capital intensive. It is also vast – some 40 kilometres long. Theoretically it would be possible to keep raising the wharves, lifting the cranes to new levels, rebuilding the infrastructure that operates the automatic trucks that distribute the containers. In practice this would be very, very costly. In terms of adaptation, how costly? Another example, but from the other side of the ledger. Malaria costs Africa alone, say, around $30 billion a year and, globally, say, around three quarters of a million deaths. Two well-advanced technical breakthroughs are very likely to defeat malaria: the first is a vaccine, now being trialled. The second is the use of GMO technology to facilitate the mass release of infertile male mosquitoes. The latter has demonstrated in field trials a powerful effect in terms of reducing dengue fever outbreaks by means of dramatic reduction in mosquito populations. (This technology has none of the pernicious, pervasive and long-lasting damage inflicted by DDT but is, nevertheless, being vigorously opposed by anti GMO groups). Based on these examples, In terms of costing adaptation, how do we factor in the power of human invention? IMHO, those who argue at low levels of detail that adaptation is cheaper than prevention or vice versa, cannot, therefore, know with any degree of certainty what they are talking about. This discussion, therefore, can only be at the very highest risk v reward levels. Some examples: at what level of chemical change (and when) will the world’s oceans stop delivering 100 million tons of protein a year? What would the cost of that be? At say, two thousand dollars a ton, the loss of ocean fisheries would take $200 billion a year out of the global economy, before flow-one effects. At what level of sea level rise do 50% of the worlds largest cities become uninhabitable? How many trillions would that cost? Is there any possible technological development that would save the cities from inundation? Is there any possible technological development that would prevent the chemical changes that may affect wild-caught fish stocks? And, if the US has neither the capital nor the political will to replace the 40-50,000 bridges that urgently need replacement where is the capital going to come from for any very large scale adaptation capital requirements? A related issue is that any climate impacts are not isolated. They sit on top of current impacts. For example, we are experiencing a mass loss of biodiversity at the moment. This is largely invisible to most commentators because it is in the form of the within-species loss of genetic variability that is occurring in most of the world’s species. In some cases this has already contributed to extinction. There being an extinction lag, there are already a significant number of species that will shortly become extinct. The adaptation issue for biodiversity is that climate changes, particularly if rapid, will sit as new and more intensive selection pressures on a biota which is already in the process of becoming genetically depauperate and, therefore, less and less able to adapt to new selection pressures. Claims for general costings of adaptation to date are over-egged because they are based on assumptions with very low levels of validity and reliability. (3) issues relating to inter- and intra- generation distribution and re-distribution. The world currently arranges resource distribution so that some people are very wealthy and others starve to death. Policy responses arising from any climate change may well alter this proportion. Similarly, current generations are capable of using one-off resources so that they become unavailable to future generations. For example, phosphorous is highly likely to become very scarce and very expensive some time within the next two hundred years. Unlike water, we cannot ‘make’ phosphorous. It is phophorous prices that are likely to be the chief threat to the world’s poor. Taking a previous example: much of the 100 million tons of ocean protein is consumed by the poorer half of humanity. Any general discussion of adaptation v prevention needs to integrate equity as a main issue. (4) getting right the balance between scientific uncertainty and probability and, therefore, related policy risks and opportunites. I won’t go into detail here because I assume that every reader of this blog will know the issues. Anyone is welcome to reproduce this article in whole or part. Just give due credit to the author and WUWT. Thanks. This article, in a sense, seems to sweep climate change under the carpet. Climate change is not a threat. It has always been inconvenient and will continue to be so. We have not, in my lifetime, experienced climate change. You will know when it happens, and it won’t be measured in tenths of degrees and millimeters of sea level change. I think climate change is the number threat to humanity in the 21st century, since it affects many other sectors as well. Humanity is dependent on climate, therefore everything then ties in together, like the inequalities between different countries and within countries. This also links to povery (sic), crime rate, the economy and more. (a)	In 1800, about 80-90% of the U.S. working population was engaged in agriculture. This had dropped to 41% by 1900, 16% by 1945, and today it is 1.5%. This shrinkage occurred despite the increase in agricultural production because other sectors grew more rapidly. In 1900, agriculture accounted for 23% of U.S. GDP; today it is 0.7%. So the dependence of economic well-being on climate and weather has is much less dependent on C&W. (b)	Because of global trade, crop failures in a region of the world don’t condemn that region to starvation as in times past. Thus, deaths from drought have declined by 99.9% since the 1920s, as noted in the post (above). (c)	As also noted in the above post, deaths and death rates from extreme weather events have declined by 93% to 98% since the 1920s. Also, I am not sure where you get the notion that Britain’s economy may fail due to a catastrophic hurricane. I think it is much more likely that its economy will fail due to misguided energy policies that push up the price of energy (including electricity). imoblok at October 18, 2012 at 2:11 pm claims I am trying to sweep climate change under the rug. By this, I presume you mean that I am trying to ignore climate change. RESPONSE: On the contrary, what I’m trying to do is shine a light not only on the impacts of global warming but simultaneously on the impacts of other factors on key determinants that GW might influence. Having done this, it seems that the former is not as big a deal (as other factors). You may not be happy with this conclusion but it’s not the result of ignoring global warming. In fact, it’s the result of giving (more than) due consideration to global warming, as explained in the post (and in greater detail in the underlying paper). If AGW causes climate changes, i.e., the world gets to hot to handle, then we have to acknowledge that before industrialization the world managed to survive and prosper when the climate generally became warmer i.e the MWP and Roman Warm Period. Populations displaced and increasing from what ever causation factor will have an impact on survival. However, climate change happens, but it is the weather and natural seismic activity that kills us off. The next is wars and disease. One heat wave in France caused deaths and most was from heat exhaustion. The temperature was 42 C, not all that hot really by Australian standards, but with millions of people turning on air conditioners or not drinking enough, one nuclear reactor was about to shut down. It spelled out a potential human disaster, such as a tsunami, volcanic eruptions, & earthquakes. Our biggest problem is if it becomes really colder, and parts of the world can’t feed themselves. An interesting observation, famines like those experienced in Ethiopia decades ago, but were not caused by climate change, but civil strife and wars and displacing people from their normal place of abode. As far a human population sizes, some nations without welfare, cannot survive well. Never have either, and that is due to their overall political management and internal strife. Oh isn’t it easier to blame western and richer countries causing their environmental problems, rather than poor agricultural practices and governments hungry to make money out of the subsistence, hunter and gatherer, people that stand in their way of so called profits. i.e. Palm oil profits, oil, burning down rainforest, gas exploration, and mining ventures? What Climate Change? The natural climate change, or the imaginary Anthropogenic Climate Change (AGW)? If you mean the AGW, isn’t that like you asking what is going to be done about someone beating their wife, before producing evidence beyond a reasonable doubt that the accusation has any truth to it? Excellent pick up. I enjoyed a rueful laugh at myself there. Wouldn’t it have been appropriate if both papers were to be submitted before one was published? This seems like an invitation for Prof Flim Flam (as he is fondly known) to merely respond to your paper rather than put forward an original argument of his own. (1)	What happens to your analysis if you stretch the timeline to 2200? (2)	What cost you put on a price on the loss of around one third of biodiversity? (3)	How would you factor in the Netherlands example, provided upstring, in your analysis? (4)	How did you factor statistics for child starvation into your famine percentages? (1) What happens to your analysis if you stretch the timeline to 2200? (2) What cost you put on a price on the loss of around one third of biodiversity? (3) How would you factor in the Netherlands example, provided upstring, in your analysis? (4) How did you factor statistics for child starvation into your famine percentages? Frankly, your questions appear to be quite bizarre considering the Earth’s past and its inevitable future. Consider the following facts, and then compare your questions to those facts. The Earth’s sea levels in the past have been as much as nearly 600 meters higher than the present sea level, and the future sea levels will also be some hundreds of meters higher than they are at the present time. In the coming decades and centuries the sea level will continue to rise a number of meters and tens of meters, until the next ice age lowers the sea levels to about 70 to 100 meters below the present sea levels. These changes in sea levels will occur whether or not humans are extinct or not. The Netherlands will have to do whatever it must do to adapt to this natural reality. Humans will be no more able to stop these natural changes than King Canute was able to order the incoming sea tide to halt its advance upon the beach to satisfy the King’s ministers. What price do you place on the pursuit of a fantasy climate hoax at the expense of destroying the economies which support human lives? But we do! We learn from history that we do not learn from history. When I read your last couple of lines, I realized that we were engaging on the basis of a different set of assumptions and a different set of assessments about the risks and probabilities involved. These differences render it virtually certain that our policy discussions will whistle past each other in the dark. There is one point that I believe we can continue to discuss, usefully. (4) How did you factor statistics for current child starvation into your famine percentages? A core methodological issue in addressing your set of statistics in relation to starvation and well-being is to disentangle what might be called the climate signal from the ‘noise’ of war and other forms of general human bastardry to other humans. One example will demonstrate my meaning. Around 3 million Indians died in a single famine in India during the Second World War. There was a bad monsoon in southern India. In one way, it could be argued that the death of 3 million Indians was, therefore, climate-related. On the other hand, it could be argued, and has been argued cogently, that there were ample food stores available in India at the time, that there was a railway system with the capacity to transport the food stores, and not one person need have died in that famine. The deaths were, therefore, the consequence of deliberate colonial administrative decisions in full knowledge of the consequences. You can see what I mean about the difference between climate ‘signal’ and human ‘noise’. There were other starvation spikes from the 1920’s on. Collectivization in the Soviet Union and the consequent mass starvation is another example. However, these were events, and spikes in a background where people did not starve to death in ‘normal’ years. Currently perhaps 15 million children under the age of five die of starvation every year. (The statistics are, I believe, open to considerable challenge). I am particularly interested in how you sieve out the political, war and adminstrative noise that has killed so many people by starvation in order to make a valid comparison between climate-related starvation in the early part of last century and the first decade of this century such that you can reach the conclusions you do. For me, an assessment of prevention versus adaptation is far more nuanced, far more uncertain, and far more difficult than a simple, axiomatic resort to a theory that several thousand individuals from dozens of nations and hundreds of institutions and through dozens of languages, the editors of all major scientific journals, and (almost all) major science academies, have been engaged in a giant global conspiracy for nearly three decades to perpetrate a hoax. On this, we differ. For me, assuming there is some sort of probability that athropogenic global warming is real, the policy discussion between prevention and adaptation depends on a complex assessment, not only of the degree of probability, but a keen assessment of the risks and costs of alternative policy responses. National-level responses include tough policy issues relating to the prisoner’s dilemma, etc, etc. I am intensely interested in the policy settings surrounding whether to ‘prevent’ or not. At the same time, adaptation is more and more interesting to me, not because it is unavoidable, but because, IMHO, H. sapiens is highly unlikely to avoid prevention, whether the latter is required or not. What I find puzzling, given your views, is why have you written your paper at all. Is it not, in your own terms, a waste of effort in the face of the inevitable? It is a fact – NOT a “theory” – that there is no evidence of any kind to suggest, imply and/or indicate that global climate variability is other than totally natural. Humans do affect local climates in a variety of ways; e.g. a city is warmer than its surrounding countryside. But that is not relevant to the subject of this thread. The reason your comments are ‘bizarre’ is because they do not pertain to reality. Instead, they assume an AGW effect exists which has no supporting evidence but is refuted but much evidence. If I were to complain to Indur Glokany that he does not consider the effect of the fairies at the bottom of my garden then my comments would be as ‘bizarre’ as yours and for the same reason. I have not yet heard anyone mention that if the climate mongers get their way and CO2 is actually reduced we will all starve to death. This is not a war on capitalism or the like, it is a war against all living things. In the broad there are two theories for explaining climate. One theory is that climate is subject to signficant anthropogenic forcing and the other theory is that climate is subject only to natural forcings. What is at dispute is not whether either or both are theories. What is at dispute is which theory is better at explaining climate. Trying to censor debate about other theories by claiming that your theory is the only correct theory and that other theories are ‘bizarre’ is, IMHO, not dispassionate scientific discourse but emotive religious dogmatism. BTW, I am still waiting to see Mr Glokany’s explication of his starvation figures. With between 50 and 150 million children, depending on how you do the stats, under five having died of starvation in the 21st Century, I believe the known statistics cannot support his conclusion. The theory that things are getting better all the time does not appear to apply to them, at least. That is rich. Indeed, if rising CO2 is going to bring economies to wrack and ruin, they would certainly result in reduced CO2. Indeed, policies to save us from the horrors of Climate Change that curtail development are a case of the killing the patient with medication. There is one point that I believe we can continue to discuss, usefully… How did you factor statistics for current child starvation into your famine percentages? RESPONSE: First, I looked at “hunger”, not “famine”. Second, the methodology is laid out in the paper. I use estimates from the FTA study for hunger for the global population at risk of hunger in the absence of any climate change, and the increase in this population at risk because of climate change. This allows me to estimate the percentage increase in hunger due to climate change. For how I estimated numbers of deaths due to hunger, let me suggest you read the paper. I don’t know about D. Patterson, but my paper does not assume that climate variability is “totally natural.” In fact, its estimates are taken from studies that use estimates of climate change based on Coupled Atmosphere-Ocean General Circulation Models (“global climate model” for short) that have passed muster with the IPCC. So, to the extent those models include (or not) natural variability, my analysis would automatically take that into consideration. However, none of those models assume that climate change is only due to natural variability. My hearfelt apologies to you for misreading Patterson’s post as your own, and for drawing false conclusions about your position. It is just as well that I was polite about it or I would have been left looking doubly foolish! I note in particular that you predicate your analyses on a significant anthropogenic contribution to climate change. Assuming this as a starting point, In genera, the closer we get to the present, the less likely it is that prevention is a superior global option to adaptation.The further we get from the present, the more likely it is that prevention is a superior global option to adaptation. Put simply the very short-term risks for doing nothing are low but the long-term risks accrue. I suggest that somewhere between now, and a long time from now, there is a switch where the benefits of prevention are less costly than the disbenefits of adaptation. The critical policy question is this: How long from now? It was this that I was trying to tease out with my questions in relation to stretching your analyses to 2200. This was also part of the background of why I raised the knotty examples of costing the loss of the Netherlands as well as the issue of costing biodiversity loss. As opposed to looking singularly foolish? I suggest that somewhere between now, and a long time from now, there is a switch where the benefits of prevention are less costly than the disbenefits of adaptation. You should be cheering! Make more CO2! But I’d doubt this is what you’d like to do. Good to see that the issues inspire good poetry. I don’t think that any serious scientists are arguing that changes to climate, however forced, will only have either all benefits or all disbenefits. I believe that most serious scientists would also agree that the balance between potential benefits and disbenefits would vary over time. By way of background, I have an extensive background in farming and, in retirement, still run a herd of methane farters. Scientists are working on food supplements and the like which reduce bovine emissions. I wish them well. IMHO, the discourse around the food security implications of possible changes in climate are frequently very poorly grounded and very rarely comprehensive. As someone who has struggled with drought and flood, literally, and with good years and bad years, I often think to myself, ‘Hey, these guys just do not get it.’ Just to give you an example. In a recent bad drought in the Murray Darling Basin in Australia the rainfall was similar to rainfall in other bad historical droughts in the Murray Darling Basin. There was a bit of piffle around whether it was an AGW event or not. IMHO, this discussion was scientifically irrelevant given the time frames involved. But there was a catch this time round. There was an exponential decrease in rainfall run-off with a linear increase in temperature during this drought compared with previous droughts. Apart from large losses in commodity production, there was a large shift in farmland equity to the banks. In my experience, bankers make poor farmers. The discourse around food security and climate is rarely time-bound. It rarely raises the implications of the potential need for agricultural systems to adapt, and adapt again, and adapt again, as any potential climate changes progress. The discourse rarely raises the implications for new capital requirements to adapt agricultural systems to potential shifts in rainfall, temperature and potential shifts in the frequency of extreme weather events. To take my Netherlands example, upstring, a step further, the Netherlands exports around $66 billion worth of agricultural products a year now, but will not do so if the sea level rises a couple of metres. If sea levels stay the same, no problem. If they rise 2 metres, which may be 200 years away, then that is not a long lead time to shift the world’s 16th biggest economy some place else. Agriculture production is driven by much more than by CO2 and the availability of farm land. The food security discourse rarely focuses on the consequences of changes for the cost of food. The discourse rarely discusses issues like the social structure of the farming populations or the degree of indebtedness of farmers to banks. For example, if a nation has farmers who average 60 years old and who are highly indebted to banks, you can predict that the relevant agriculture sectors are not well-placed to adapt to any potential shifts in climate. There is only very rarely a comprehensive discussion which integrates the cost of capital, the cost of energy and the cost and availability of inputs. These three keys to farming out of a bag, super-imposed on climate, determine the number of people in any one year who will starve to death. To give you an example of what I mean. The impact of fracking on gas prices will mean lower energy costs, lower fertilizer costs and lower pesticide costs such that tens of millions of people will be saved from hunger. Whether that makes fracking, on balance, good or bad, I don’t know enough about to say. So, the general discussions about the nexus between food security and potential climate changes do not give me confidence. In this particular case, the issue is the balance between potential benefits and disbenefits arising from the two major options – prevention and adaptation. One thing is clear: those who espouse one alternative and list only all the benefits or all the disbenefits arising from same, are almost certainly only painting half a picture. They may mislead by accident. Or they may mislead deliberately. I wouldn’t know. But they are misleading. What H. sapiens needs to do is get as close as possible to the whole picture, dispassionately and rationally. You earned a rueful smile for that one. A chap can’t be too careful around here. It is an hypothesis – n.b. NOT a “theory” – that human activities may be discernibly capable of affecting global climate. A theory has some supporting evidence but a hypothesis doesn’t. It is a theory that climate may be subject to natural forcings. you have attempted to rule-out of discussion other – and better – possible explanations climate variability. The quality of as troll is not indicated by the troll’s verbiage: it is indicated by the validity of the troll’s assertions. May I agree and disagree, slightly? (2) be capable of being falsified. Otherwise, you’re just spouting philosophies, notions, hopes and beliefs, however well backed-up you might be by models and logic. This is where climate science largely is at the moment. The Earth’s extremely complex climate system, hugely fed by input from the Sun and subtly modified by magnetic and other aspects of the surrounding space, is poorly understood. We don’t even understand the inputs, yet, let alone what happens after those inputs reach our biosphere. And, of course, the predictions (invariably of gloom and doom) are either unable to be falsified, or unable to be told from natural variation, or both. If they predict that Antarctica will be colder, and it isn’t, well, they predicted that too. Oh, it actually is colder? Well, they said that all along! Anthropogenic global warming would be falsified in five years. No, ten years. Twelve! Fifteen! Sometime in the ambiguous future! But in the meantime, Global Warming is Real! No more snow! Ah, extreme snow? Well, that’s “not inconsistent” with our predictions! In short, such guesses are worthless. And positive indications, the actual increase in crops and so forth directly attributable to increases in CO2, get little airplay and little interest in the journals. The FACE (Free Air Carbon Enrichment) experiments have demonstrated great success from crops to trees, but they take these results and suggest that weeds will do better than edible crops, or that “popcorn will no longer pop and beer will be poisonous” as Nature reported in August of 2007. The saddest part of all of this is that progress in some areas is being opposed and corrupted by the desire to come up with the “right” answer. Scientific American had an editorial a decade or so ago in which they said that if you offered a paper that suggested that global warming was not a crisis, they’d “laugh in your face.” We’ve seen, over the years, the selection bias that results from this distortion of the scientific method. We have had models of physical systems for centuries, which are increasingly complex. In the process, we’ve gone from notions too simplistic to be useful (as improved observations showed) to models complex enough to no longer be understandable themselves, while still only a tiny sliver of the complexity of the real biosphere. And we run those models, see if they produce the “right” answers, then tweak and run them again until we get what we want. All published models have gone through this; their “raw” output based on “logic” never sees the light of day until many (sometimes thousands of) iterations later, when the modelers like the result. From this sort of filtered, distorted output, “howskepticalment” and others have gotten the idea that there is an impending crisis, that the reality of massive food increases (due in part to CO2) are harbingers of food shortage, and that the pleasant (for humans) biosphere of recent decades portends doom for us all. Earth’s billions of years of feedback be damned! Much of climate science, while describable loosely as “theories” in the colloquial usage that has even been adopted by scientists of various disciplines, is still far from being constrained by proper testable hypotheses. And such constraints are actively resisted, for a variety of motivations. Thankyou for your post addressed to me at October 20, 2012 at 9:19 am. I read it and I agree. I have been polite to you. You have been rude to me. IMHO, you reduce your scientific credibility through the use of terms such as ‘stupid’, ‘troll’ and ‘verbiage’. Your position, if I am correct, is that you are 100% certain that there is no evidence at all that there is an antrhopogenic impact on climate, Changes in terrestrial hydrology, changes in land cover, the Asian brown cloud, ozone gases, aerosols, soot, greenhouse gases have had, and will have, no impact at all. None. My view is that there is some but that the question is how much. You are not “correct”. You have (deliberately?) put words in my mouth. Of course humans affect local climates in several ways; e,g, cities are warmer than their surrounding countryside. But there is no evidence – none, zilch, nada – that any human activities have a discernible effect on global climate. If you think you have some such evidence then provide it to the IPCC. $billions have been spent each year for decades in attempt to find such evidence and – to date – none has been found. But much evidence which refutes the AGW hypothesis exists. Your trolling this thread with unsubstantiated, long-winded assertions and misrepresentations of the views of others is annoying. And I cannot be more ‘polite’ about your behaviour than that. I disagree with your assumptions. I find your discussion of the impact of atmospheric CO2 concentrations oversimplied and reject, in passing, your putdown view about how I synethesize information and misinformation. I do not understand your reference to a ‘pleasant biosphere for humans.’ There is not an ‘impending’ crisis. We are in the midst of a global food security crisis. Therefore your term ‘harbinger’ does not apply. Millions of people starve to death every year and hundreds of millions more suffer hunger. Not a pleasant biosphere at all. I doubt whether the addition of the two billion individuals being forecast by demographers will alleviate the situation. You raise the issue of atmospheric CO2 concentration as if it is the sole criteria for determining the value of prevention or adaptation in relation to the specific issue of food security. As it turns out I have some practical experience here. For example, there is a greenhouse tomato farm a few towns along the road which pumps CO2 enrichment into the hothouse. I have had a look at it. The production improvements are great, providing the additional nutrients are provided. But crops are potentially constrained by a variety of factors, not just by atmospheric CO2 concentrations: genetic potential, availability of key nutrients, water, sunshine, heat range, seasonality (eg frost limits), weather events (eg cold snaps, heat waves), farming techniques, availability of pesticides, etc, etc. IMHO, the debate about the impact of CO2 enrichment of crops is essentially irrelevant to food security in all but highly specialized situations such as greenhouses. Any open field growth impact of current changes to CO2 atmospheric concentrations are entirely over-ridden by a number of other trends: the global destruction of groundwater aquifers, nutrient availability, the loss of soil extent and soil quality, capital costs, energy costs, and desertification. These are, in turn, being offset by improvements in irrigation efficiency, GMOs, cheaper energy, and massive increases in farm subsidies. I raise the latter because the way to integrate the pros and cons of atmospheric CO2 concentrations on food security is by integrating the impact on price, not by cherrypicking a physiological impact on plant growth. Just to remind you: in our pleasant biosphere, food price is what is starving people. I raise these issues because I note the proponents or opponents of certain positions routinely present that prosition in black or white terms as if the outcomes are all good or all bad. Many of the posts in this string provide examples of this. The way in which you raise the productivity benefits of atmospheric CO2 concentrations is another such an example. IMHO, BTW, the over-use of phosphorous leading to global phosphorous shortages will be the single most important limiting factor on food security over the next two centuries. I have had numerous discussions with crop scientists and they simply shake their heads when I raise the topic with them. And right there you have it. The increased CO2 in the atmosphere has, according to the FACE experiments and in-laboratory work, increased the growth of productive crops on the close order of 15%. This means about a one-in-seven increase in food production, independent of other augmenters such as improvements in fertilizing, plant breeding, and mechanation of farming. Thus, about one extra billion people are being fed from the increase in CO2 alone. In addition, the cold 1970s, which inspired a very early gathering of climate scientists (in a symposium hosted by the FBI, greatly concerned about the impacts of global cooling) finally abated, and temperatures have begun to return to a “climate optimum” (though not as warm as in earlier, happier times in human history. This added warmth has also increased crop production. Tornado counts are dropping, hurricanes are calming (though these seem to operate on about a 40-year cycle, and the drop won’t likely be forever), and droughts are nowhere near as severe as during the middle portion of the last century. It is instructive to read that FBI document from the gathering, and look at the litany of recent climate disasters they cite! Imagine how many more people would have starved to death this year had we not been living in our current pleasant climate period. Incidentally, I did not intend my comment as a put-down. Many reasonable people have been taken in the same way; it is hard to avoid such a perception given the media (and now government) dominance of the idea of catastrophic global warming. For example, there is a greenhouse tomato farm a few towns along the road which pumps CO2 enrichment into the hothouse. I have had a look at it. The production improvements are great, providing the additional nutrients are provided. You imply, but do not state, that the extra CO2 has little or no effect without extra nutrients. Had you explicitly said this, you’d have been incorrect. Many experiments have shown that increased CO2 in the range of a century ago to a few centuries from now improves plants’ ability to make use of existing nutrients. None show otherwise. To get to such notions, they have to include things like “well, droughts will be worse and thus the net increase will be negative” or “ozone will be worse” or similar incorrect assumptions. That plants in enriched CO2 can actually use more nutrients, if available, is simply a force multiplier. But of course, the carbon in CO2 is itself the major nutrient. You may consider reading FACE experiment discussions with a careful eye to get past the politically correct. Here, for example. Just to remind you: in our pleasant biosphere, food price is what is starving people. Oh, yes! Global warming catastrophism indeed has a body count, as they say. Carbon taxes and regulation are reducing the use of inexpensive energy in food production, raising the price. And the manic overemphasis on biofuels, logic be damned, diverts foodstuffs to soi-disant “green fuel,” also raising prices of course. The result is food shortages and food crises from those in poverty not being able to afford blithe catastrophism; it literally takes their food away. Similarly, cheap fossil fuel power is denied to them, as it is not sufficiently “green” — so those in poor nations are still stripping rainforests for fuel and dying from indoor cooking with unsafe materials. Catastrophists are killing people for the sake of “the planet” — a rather bizarre and misguided notion, in my opinion, but demonstrably true. I accept your statement that you were not trying to put me down. But then you cannot let it go: ‘Many reasonable people have been taken in the same way;’ This sort of stuff is a blight on rational discussion. I notice that you use the pejorative term ‘catastrophists’. Let’s for the sake of discussion accept the FACE results as read, rather than as contested. Let’s also, for the sake of discussion, assume that human forcings will have a signficant impact on climate. (1) CO2 is only one input and treating the impact of CO2 in isolation from other inputs is too limited a way of assessing the impact of atmospheric CO2. (2) the biosphere is not pleasant when millions of people starve every year. (3) phosphorous rather than climate is likely to be critical limiting factor when it comes to food security over the next two hundred years. (1) crop growing weather, compared to some previous decades, is good right now. It depends on your time frame. There have been worse growing conditions, globally. There have been better growing conditions, globally. Northern hemisphere commodity crop production this season was well below average, mainly due to low rainfall and high temperatures. All that CO2 with nowhere to go. Fortunately, the GMO outputs meant that some corn crops did much better than traditional corn varieties would have done under the same growing conditions. It remains to be seen whether southern hemisphere exporters are able to pick up the slack. They will pick up the good prices, but probably with less grain. Regardless of what happens with spring rains from here on in, we already know that there will not be record production. Global food commodity prices have been at the high-ish end (but quite volatile) over the past half decade or so. Adverse weather has been only one input to these prices. I accept your point that bad growing conditions increases global starvation. (2) AGW policy responses are killing people. This makes partial sense, provided we bound our discussion to the present and provided we assume that humans will not alter climate significantly. IMHO, biofuel subsidies are killing lots of people right now, and should be stopped at once. However, biofuels are not, as far as I know, widely supported by supporters of AGW theory. In general, it is rent-seeking rural lobbies that support government subsidies for biofuels. Beyond that, whether prevention would kill more people than adaptation over time, depends IMHO, on the time frame you apply. Richard et al, let’s get something straight first, as Richard would agree with. Human’s pollute waterways, cities, by cutting down large tracts of rain forest the clouds go higher, less precipitation. The more people crammed into an area like Bangkock, it’s filthy, with smog, rotting garbage, poor sanitation and disease. But outside those cities, the temps drop as more wind circulates and there are less people. However, when the Nile was dammed in the 1960s at first it finished the Delta fishing industry, increased malaria, and that snail ingestion. Thirty years later the fish industry returned, malaria had been eradicated and they had a vaccination against that water snail. Nature can adjust, but of course the farmers around the Nile spend thousands of dollars on fertilizers, as they no longer have the Nile fertile silt, naturally fertilizing their crops. I wonder who sells them the fertilizers? Pollution can be cleaned up, but we can’t change the weather. I am happy that that you are not standing behind an apparent willingness to kill millions of people now on the notion that this might somehow prevent the deaths of more later. This position is advanced by too many. I use the phrase “catastrophists” because of (1) the treatment by so many, including the core researchers, of this issue as something more important than truth, and (2) the fact that the word “catastrophe” and its variants are so frequently part of the predictions advanced upon society by this core group and its media and government apparatus. It is intended to be a shorthand rather than a perjorative — and to distinguish those that believe that failing to implement “prevention” or “adaptation” of climate change will necessarily cause a catastrophe from those that accept that there was a warming period from the 1970s to the 1990s, which has not seemed to cause significant harm. I have been included in lists of people who support the global warming “consensus” which might give you a notion of how that consensus might be a little misleading. And I write science for government purposes as my “day job” — you must, by law, be or pretend to be a catastrophist in my profession. That is how corrupt the process has become. CO2’s effects upon crop growth must be understood in isolation. Only then are you able to reasonably combine this effect with the improved growing seasons, increased arable land, and other improvements in order to judge just how much better food production will continue to be. To suggest that CO2 may be useful by itself but won’t help because conditions are so bad is to ignore a lot of facts, including the point that CO2 increases make plants more resilient and more efficient, better able to use other resources well. You’ve had a fortunate year: a combination of a mild (and massively overplayed) drought that brought crop production down to one of the best yields ever in human history — but not the top yield this time. Next year, if yet another record yield is achieved, where will you go? There is only so long that the media can hype normal weather variations as “extremes” — and as those lies fall apart, others are being looked at more carefully. I imagine you’ve seen the records of how mild this drought was compared to past decades. We tend to think that yesterday’s events were more significant than last week’s or last year’s, and the hype machine was not engaged even in the 1988 drought, let alone the 1950s and 1930s. Population increases can outpace even an instant doubling of food supply. The corruption massively evident in African countries, for example, prevents food from getting where it needs to go — no amount of it fixes that. Moreover, the charitable handling of food gifts as done now has created a continent of dependency; we regularly put local farmers out of business. And corruption; the food winds up rotting or (too often) traded for other fungibles such as weapons. It is green-energy, climate-change-is-gonna-kill-us-all (i.e., catastrophist) folks pushing the biofuel business. Some now recognize that this is foolish and deadly, as you have acknowledged. Is the biofuel bit lobby-based? Certainly — as is windpower, solar power, wave power, et cetera; all transparently political. The situation with fossil fuels is not quite the same, though there are still issues there. States (and countries) allow oil companies tax subsidies to entice them to their tax jurisdiction, as they create literally billions of dollars’ worth of jobs and boost economies. Funding a solar power company because it is captained by people that donated to your campaign, and is expected to produce trivial growth and jobs for the money while providing a mechanism to siphon cash back to your supporters, is just corrupt. My druthers would be none dying of starvation now and none in the future. I could cobble together a set of policies that would deliver that outcome. Given you evident expertise in the area, so, I imagine could you. I forbear from using the term ‘ostriches’ because labels neither inform nor improve the emotions. What consensus? OTOH, if you are publicly toeing the government line and you look, walk and talk like an AGW consensusist, then it is perhaps not surprising that you have been added to the list. I was once head hunted for a significant promotion in a government department. I was a leading national policy expert in the area. I told them that I disagreed with the policy settings, and with the values upon which the policies were based and further, that the policies would not work. (They eventually failed). I further pointed out that neither my head nor my heart would be in implementing the policies. No promotion, so it cost my quite a bit of money and put my career on the backburner for quite a while. But I could lie straight in bed at night. I hesitate to say it because it is your business. You are a good writer, IMHO – a better writer than I am. But then English is my second language, so I have a sort of reason. Anyway, maybe you should go and work in an area where you do not have to outwardly conform with government settings, views and policies with which you disagree. BTW, there is legislation which prevents me from discussing any information to which I had access at that time. And also at the time, I would have lost my job had I publicly criticised the government’s policies. This situation applies regardless of the colour of the government here. Yes. We need a few nice follow up rains here and there and that would be the icing on the cake. : a combination of a mild (and massively overplayed) drought that brought crop production down to one of the best yields ever in human history — but not the top yield this time. Next year, if yet another record yield is achieved, where will you go? There is only so long that the media can hype normal weather variations as “extremes” — and as those lies fall apart, others are being looked at more carefully. I imagine you’ve seen the records of how mild this drought was compared to past decades. We tend to think that yesterday’s events were more significant than last week’s or last year’s, and the hype machine was not engaged even in the 1988 drought, let alone the 1950s and 1930s. I followed this season’s US drought, wildfires and crop yields with a great deal of interest. I usually don’t take any real interest in what the MSM says about any of that sort of stuff: it is a waste of time. You seem to know a lot about it and I would be very interested to know your views about the nexus between the areas planted and the total production. I did keep saying to folks here that one of the reasons it was not a disastrous crop was GMOs, but lots of people are impervious to that particular message. I agree with a lot of this. I would add the general distribution of global wealth and the propensity of wealthier people globally to eat from higher trophic levels as compounding factors to the situation you describe above. I am happy to accept your point (without accepting the pejorative framing) if you are saying it applies to the US (I am not sure where you are based). In Australia it is the farm lobby that is pushing the biofuels barrow. In terms of political power, moral equivalence, and the ability to influence (note neutral term), the fossil fuel mob here have always had it all over the renewables. The reason is fairly straightforward: the fossil fuel mob are a dominant industry in Australia. All they have to do is pend $20-30 million on a pr campaign and it is all over red rover for the government of the day. Once again I imagine that this would vary from country to country. My being counted as part of the consensus is due to my accepting that it has warmed from the 70s to the 90s. That’s all it takes, really — this lumped me in with the catastrophists, due to the structure of the survey questions. As to the other, I have focused my work on areas other than the environment, but there is no part of the government untouched by the catastrophists. For example, a project I am working on at the moment involves a medical device to be implanted — but even such a device, with power in the microwatt range, must have a complete environmental impact analysis done. My previous work in wordsmithing on a multi-hundred-million-dollar contract with the US government was well accepted, but it too involved all sorts of kowtowing to the notion that carbon dioxide was a horrifically bad, scary substance that my client must commit significant resources toward eliminating. If you were to say “I will not participate in any activity where I have to agree with or support catastrophists” then you simply cannot work. Want to be a bag boy at minimum wage? More and more jurisdictions are requiring that you cannot honor the customer’s choice of bag — and in some places, cannot use any bags, and must load the customer’s food into unsanitary re-used shopping sacks they provide. A fry cook? Similar constraints have crept into the lowliest kitchens. I am reminded a bit of the frenzy decades ago to get rid of preservatives. This effort killed people, too. More recently, it is organic food that is all the rage — and the source of a tremendous number of deaths and illnesses due to food poisoning. I think this is a phase that will pass. But it is not reasonably possible to escape, at this point. I am careful in my wording; it amuses me to write for that audience in such a way that they will interpret the way they expect, but only because of their expectation. There is a proposal in California to require GMO labeling on food. I actively oppose it, as I’ve written here, because of its bureaucratic and trial-lawyer-supporting provisions more than the GMO aspect. I will stop cluttering up our hosts’ thread with this rather off-topic wandering. In short, I think that Indur Goklany’s approach is good, and the categorization is correct in essence. Now back to my medical devices. Here’s a possibly relevant WUWT thread from three months ago. It says that a warmer world would be better, except for sea level rise—and that we could afford to adapt to it in 100 years under a Business as usual scenario. Looks like we continue to agree on some things and to disagree on some other things, including the big things. Thanks for the insights along the way. Thankyou for your post at October 20, 2012 at 6:24 pm. And, yes, I do agree. Thank you richardscourtney, but I have been a climate change skeptic, before Al Gore started his campaign and wanted to convince us that unless we changed to clean energy sources we would all suffer the consequences AGW. Then the academy award and the Nobel prize, I nearly choked. But I will say, that we have to be aware that we can change the balance of demand for energy, it is advanced countries life blood to maintain our energy dependent life styles. I recall Sir Mark Oliphants predictions that oil would run out one day, and Australia and all desert regions could capitalize on solar thermal or natural gas. He felt Australia could in the future supply our continent with solar thermal plus if we can learn to transport it, to other countries. The problem being what happens when the sun doesn’t shine at night. Senator John McKay had a talk he is a NSW Greens representative. He did not believe in electric cars, he did not believe in solar panels or even wind turbines. But he did believe in solar thermal generation. I believe one Australia coal generator is switching to black coal as it is less polluting. And another that is switching to a large solar farm combining it with coal or gas electricity generating. In Canada, they use mainly gas I believe, although very very expensive. Having lived in London and traveling from Potters Bar to the City by train, I remember my white petticoat always collected a two inch rim of dirt when they had steam trains. And the big Smogs of the 50s, that killed so many, and in the early 60s London switched to a smoke free zone. Within 10 years the city cleaned up the Thames, and dolphins were seen swimming there. So coal burning is dirty when the humidity near rivers or seas intensifies a SMOG formation. But they burned coal lite instead of black coal, or coke. We have to clean up our farming practices too. Especially in Australia where they used Super Phosphate so dramatically, they forgot that on its own it does nothing but kill off microbiology that naturally fertilizers the soil, providing enough water is conserved. So some chemical fertilizers and insecticides do more harm than good. Enough said now, but having passed my Diploma in Organic Agricultural production, I think I know, that farming practices around the world and in Australia have to be improved to provide us with the food we need and not deplete the soil. And increase soils conservation of water, by adding humus or organic materials. It doesn’t matter how it started, the potential is there for another pandemic that would spread much faster these days than we might be able to control it. I did not associate pandemics with Global warming not even by implication. MOD please remove this post by JennyR as it is untrue. I understand your reaction to JENNYR at October 22, 2012 at 3:03 am. You made a good post and JENNYR misrepresented it. Please try to not be too upset. JENNYR probably does not exist. WUWT has recently been suffering a severe troll infestation. Some of the trolls may be the same person(s) and others may not be people but merely computer programs. Their purpose is to disrupt and to defame with the objective of inhibiting debate and discussion which would inform people. Some may also be employed (indeed, payed) to promote special interests (e.g. Big Wind). You have refuted the falsehood and – hopefully – that will be an end to it. The problem arises when some troll starts stalking you: I was driven off the blogs of Jo Nova and Judith Curry by such targeted trolling. But one such trolling incident by JENNYR is nothing like that. Please do not let this incident deter you from making future posts on WUWT: JENNYR will have ‘won’ if it does. And your post was good so I want to read more from you.